Not all kids are interested in pencil and paper activities, but it helps to turn them into play – like this fairy writing fun. Have you ever seen any? 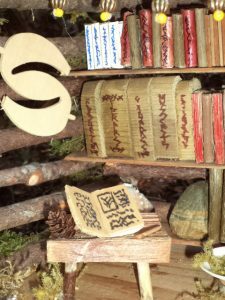 Who knows what fairy writing looks like? Since none of us have ever seen any, one idea is as good as another. We can ask kids the question and let them show us what they think. Kids can choose something they would like to write with. Paper and crayons are one possibility. Markers are nice and big and easy for little hands to use. Some kids will like to use only one color, while others will want to use them all. Fairies and mythical beings are small, but their writing might not be. After all, they can use the whole sky. 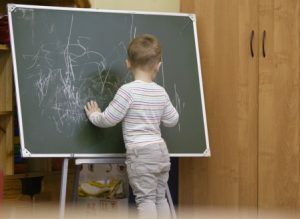 For bigger writing, kids can use chalk on a chalkboard or easel. A whole sidewalk is bigger still, but not as big as a whole driveway. Watch for cars to be safe when playing on driveways. Kids can also try fairy writing with sticks in the dirt, or fingers in sand, or brushes and paint. 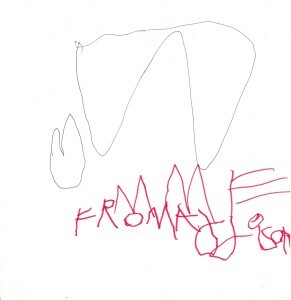 Children’s first early writing is scribbling. They will pass thru several stages as they develop writing skills. 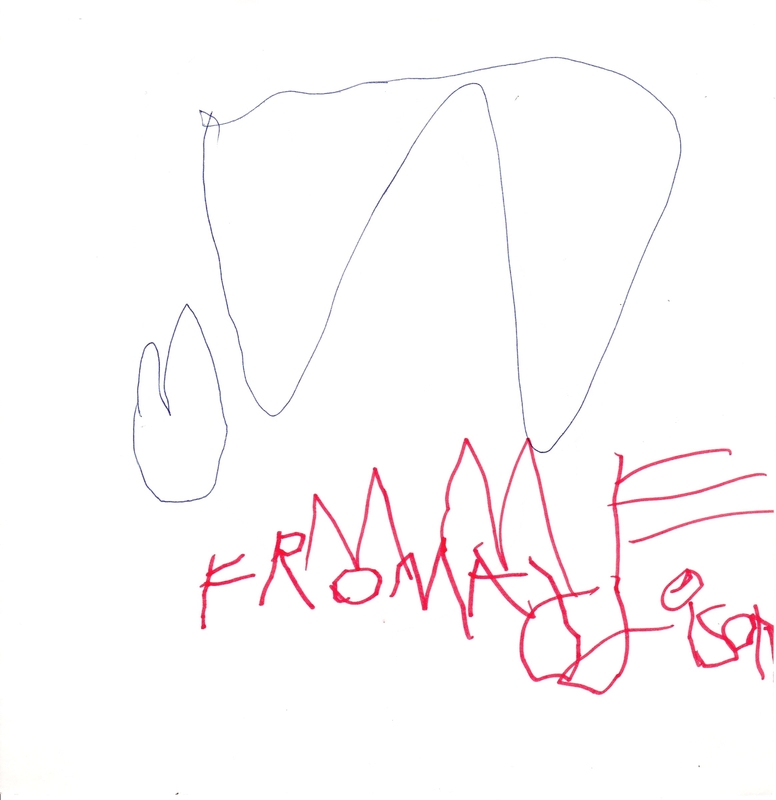 About the age of 2½ to 3½ years of age, we may notice lines and patterns in the scribbling. For children who have looked at lots of books as we read to them, they gradually use scribble shapes that resemble letters. All kids need lots of play experiences with tools and books so the brain can become familiar with how letters look. Fairy kids would need to look at fairy books. One of the most important things for kids to understand is that writing tells us something. The squiggles and scribbles are ideas written down. 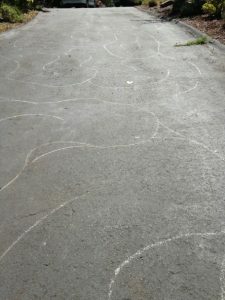 When kids are creating their fairy writing, we can ask what the fairy –or elf, imp, sprite, leprechaun, gnome, or whatever creature most interests your child, is trying to say? Since we are not fairies, we can’t read it so we need kids to help. For a play-of the-day, might your child like to try fairy writing fun? 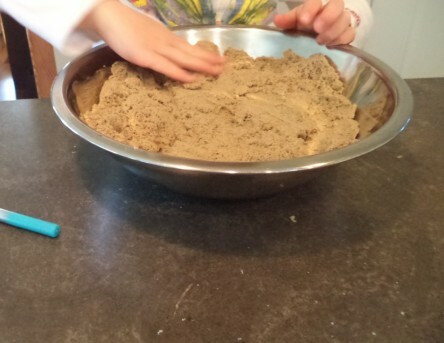 For more fairy fun, come and play on the 123kindergarten blog. Have there been any scribble messy play art attacks on the walls, floors, or furniture at your house? Scribble messy play took to the stage here recently. Lots of kids got up close and personal with scribbles, as well as some adults, at the annual Children’s Book Fest hosted in the city. Many of us have ‘been there and done that’ when it comes to early scribbles. 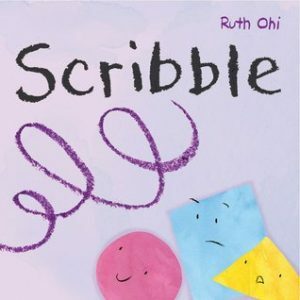 Children’s author, Ruth Ohi, has just written and published a book called Scribble. In the story, the regular shapes of Circle, Triangle, and Square meet scribble. At first, they are not sure what to make of Scribble, but together they create waves on the water, a string to hold tight to a balloon, and more. Seeing all the kids scribbling away reminded me of a blog post on the site Messy Monkeys, “learning to ‘dot dot dot’ and ‘scribble scribble scribble’ gives your child a head start in the muscle development required for when they (sob…) head off to school.” Just like children babble and coo when they are first learning to speak, they make random marks and scribble when they are first learning to write. 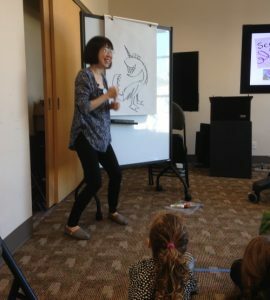 Scribbling can happen with crayons, pencils, chalk, paint, a stick, and more. As for options to paper—and the walls—they can scribble on sidewalks, driveways (watch for cars) and old sheets hung on a fence. Scribbles do not have to ‘be’ something. They might very well just be scribbles. As children scribble, they are not only learning about writing, they are experiencing the joy of creating and of expressing themselves in a form other than words. 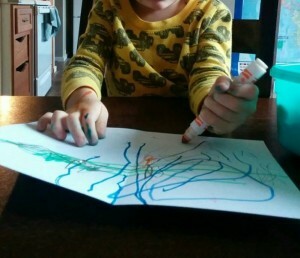 Could messy scribble play be part of your child’s day? While learning the letters of the alphabet is not a requirement for all kindergarten programs, some familiarity and letter knowledge will help every child when it comes to basic kindergarten readiness. Motivating a young child to practice printing letters of the alphabet can be quite tricky. Printing is not an easy activity for kids–the necessary muscles and coordination for such fine motor control are still growing. Small muscle development is very much at the early stage for young children. We can spark kids interest and help them practice and develop control with activities that have a little challenge and a big appeal. 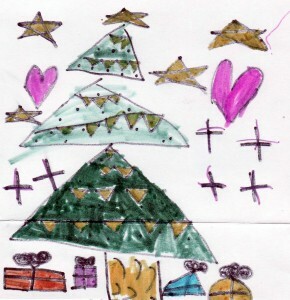 What can have more appeal than adding their very own creation–in either letters or drawings–to holiday messages? Do you need some placecards for a holiday meal? 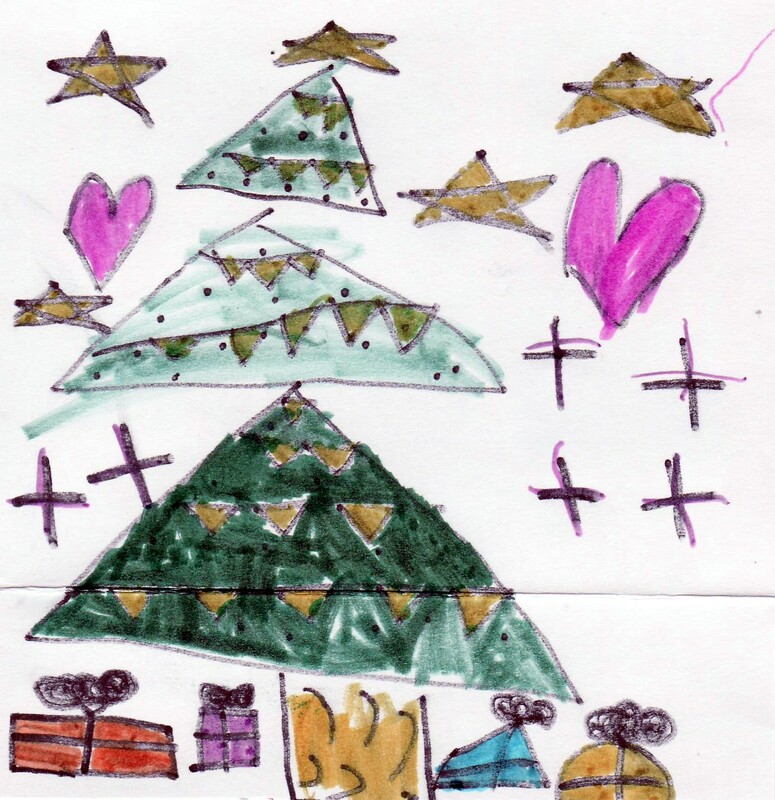 Are you sending any greetings in the mail to families and friends? A few colors, some paper and a space to work in and kids will eagerly contribute. 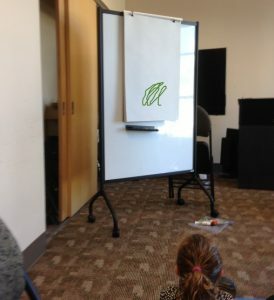 In addition to helping develop small muscle skills, having kids “write” also helps them develop the the understanding that images on paper have meaning, which is a basic concept for both reading and writing. Drawing and coloring encourages readiness for kindergarten. Some sticky contact paper over a favorite drawing turns it into a placemat or special gift and will protect it for years to come. Do you see their little faces light up with pride and joy in their work?